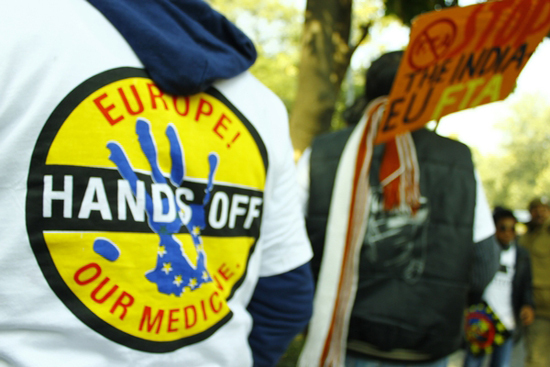 Learn how a free trade agreement between the European Union and India could restrict access to affordable medicines for millions of people with HIV/AIDS and other diseases and conditions. Nearly 2,000 people living with HIV rallied in the streets of New Delhi at the start of the EU-India summit along with MSF and other civil society organizations. India has been called the “pharmacy of the developing world” because it produces a large number of high-quality, affordable generic medicines. Thanks in large part to competition stemming from Indian generics, the price of first-line antiretroviral drugs (ARVs) dropped from more than US$10,000 per person per year in 2000 to around $150 per person per year today. This significant price decrease has helped to facilitate the massive expansion of HIV treatment worldwide: more than 80 percent of the HIV medicines used to treat 6.6 million people in developing countries come from Indian producers, and 90 percent of pediatric HIV medicines are produced in India. Doctors Without Borders/Médecins Sans Frontières (MSF) and other treatment providers also rely on Indian generic medicines to treat other diseases and conditions. But a free trade agreement (FTA) currently under negotiation between the European Union (EU) and India could greatly restrict the ability of Indian generic manufacturers to continue producing high-quality, affordable medicines that millions of people with HIV/AIDS and other diseases and conditions rely on to stay alive. The EU is pushing India to accept particularly harmful provisions in the FTA that go beyond what international trade rules require. IP enforcement provisions proposed in the FTA could have a range of harmful effects on the production and dissemination of generic medicines and how Indian courts can handle disputes over intellectual property rights. These provisions range from legitimate medicines being blocked from leaving India on their way to people in developing countries if a multinational company claims that their IP is being infringed upon, to third parties—such as treatment providers—being embroiled in court cases simply for buying or distributing generic medicines. If India agrees up to these clauses being included in the FTA, the Indian judiciary will have its hands tied and will no longer be able to balance intellectual property rights with people’s right to health. This is in direct contravention to a country’s right to place public health above IP rights as outlined in international law through Trade-Related Aspects of Intellectual Property, otherwise known as TRIPS, which India is party to. In 2008 legitimate generic medicines from India passing through European borders were seized when European patent-holders claimed that the medicines infringed upon their patents. This occurred even though the generics were in transit to African and Latin American countries where the patents were not recognised, and as such there was, in fact, no patent infringement. Investment provisions outlined in the FTA would allow a multinational drug company to directly sue the Indian government if a company feels their IP rights are being infringed upon by government action. This could happen if, for example, the government decided to regulate drug prices or override a drug patent in order to allow generic manufacturers to produce more affordable versions of a medicine deemed important for public health. Despite this being allowed under international law through TRIPS, the company could claim the government’s action negatively impacts their ‘investment’ in the country. The investment rules proposed in the FTA would allow for companies’to sue the government through secret dispute settlement panels, outside of the national court system, which is currently unprecedented in the country. The tobacco company Philip Morris is currently capitalising on investment rules in trade deals to sue Uruguay and Australia for introducing plain packaging laws banning all branding on cigarette packets as part of their public health campaigns against smoking. By ensuring that public health warnings are included on cigarette packs and removing branding from cigarette packs, Philip Morris claims that the countries are infringing on tobacco company’s trademark and investment rights. Don’t bring it back! The EU has stated that they are no longer officially demanding data exclusivity, but, behind closed doors, the EU continues to pressure India to change its laws. The EU must keep to its commitment- NO data exclusivity in the FTA. Exclusive rights over pharmaceutical test data—so-called data exclusivity—is a backdoor way for multinational pharmaceutical companies to ensure they have a monopoly on their product and thus charge high prices even when their drug has been found not to deserve a patent or the patent has expired. Data exclusivity would delay the entry of generic medicines into the market by preventing India’s drug controller from registering a more affordable generic medicine for the period of data exclusivity—usually 5–10 years. Regardless of patent status, in order to register generic versions of the drug, generic producers would have to submit their own safety and efficacy data, which would require them to repeat clinical trials—something that takes years and involves costs that the generic companies usually cannot afford. But more importantly, repeating clinical trials is unethical, as it requires withholding medicines already known to be safe and effective from some patients (the control group), solely for registering the generic version. By effectively extending patent periods and allowing for monopoly rights even when patents aren’t granted or have expired, data exclusivity protects originator companies from price-busting generic competition, thus keeping prices often unaffordably high. Data exclusivity provisions included in the 2001 Jordan-U.S. Free Trade Agreement resulted in the delay of registration of generic versions of 79% of medicines between 2002 and mid-2006. Without generic competition, Jordan spent additional sum of between US$6.3 and $22.04 million on drugs during this time period. To learn more, please the MSF Access Campaign's website.